Gabions, gabion baskets, stone baskets, stone grids and accessories for private and commercial customers. 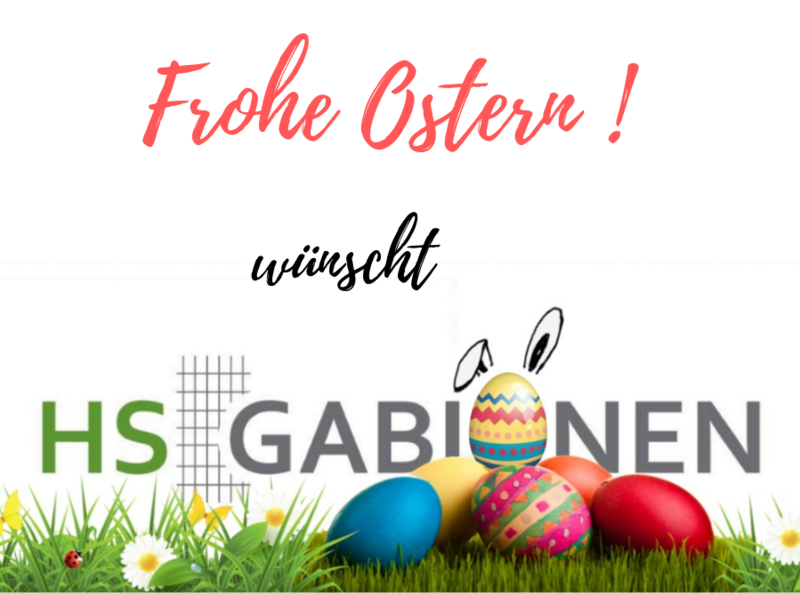 At the professionals of Gabionenbau HS GmbH you will find gabions and stone baskets for your garden, your project, for slope fixings, garden design or walls. Buy the gabions you need quickly and easily in our online shop. We have a large selection of gabions and stone baskets made to measure, which are suitable for a wide variety of applications. Based on our many years of experience in gabion construction, we will advise you competently and extensively on each of your projects. From now on we can also supply you with exquisite filling material (30 different types) from granite to sodalite and glass chunks in different colours and in different container sizes (Big Bag)! Our gabions are quick and easy to assemble. You don't have to be a professional craftsman nor do you need special tools for assembly. With our detailed assembly instructions and our telephone support, we are happy to help you quickly and easily. Gabions are extremely durable. Their 4.5 mm thick steel wire and Galfan coating offer the best corrosion protection (at least 3,000 h salt spray test). They are very robust and extremely weatherproof. 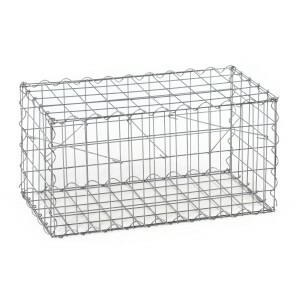 The wire mesh baskets and gabion stones are low-maintenance, no fence to paint or hedge to cut! Fully customize the look of your gabions to your personal preferences. We also offer special sizes on personal request and cut them to the appropriate size for you. Due to our variety of filling materials, all design possibilities are open to you. Last but not least, our gabions convince with their harmonious price-performance ratio. The slightly higher purchase price compared to other materials is offset by the enormous durability and low maintenance requirements. In addition, we ship your goods at a fixed price, regardless of the size of your order. Stone baskets with the appropriate filling are not only excellently suited for setting up a gabion fence around the property. Gabions can be used to set individual accents. These give every garden that certain something. These can be columns, cones or cubes, waterfalls, benches, fireplaces or fascinating lighting effects when the gabions are filled with illuminated glass stones. There are virtually no limits to the imagination, both in terms of form and filling. Not to forget: Behind a gabion fence you can also hide boring walls, for example of a garage, or the parking space of garbage cans. On top of that, the stone baskets are cheap and quick to set up. 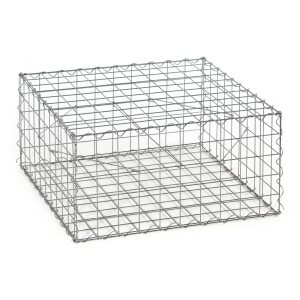 Gabion baskets are ideal for designing a raised bed. Gabion raised beds do not only embellish every garden and add variety to the overall picture with their interesting structures, they also offer some practical advantages. Regardless of whether the area is covered with ornamental plants, fruit or vegetables, the height of the stone baskets allows you to work comfortably over a longer period of time, thus protecting your back. 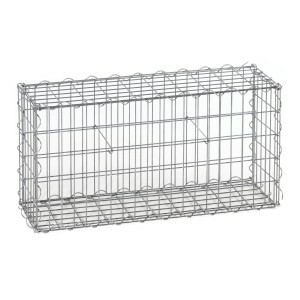 In addition, a gabion raised bed provides more soil heat, for example for more sensitive plants, and at the same time provides better protection against vermin than an ordinary bed. The gabion wall with its stone filling is also resistant to rot and all kinds of weather influences, so that garden owners can enjoy their raised bed for many years to come. Our Gabions Online Shop offers a variety of possibilities to create your own individual raised bed. Would you like to buy gabions quickly and easily? Our Gabions Online Shop offers you the opportunity to inform yourself at home about gabions and stone baskets, prices and advantages. 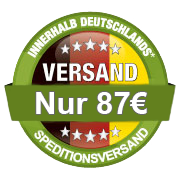 We exclusively deliver top quality from German production and sell them all over Europe. 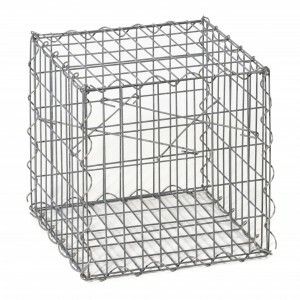 Our gabion grids and gabion spirals have a wire thickness of 4.5 mm, the spacers a thickness of 5 mm. Buy and design gabions, with our gabion constructor you can get your individual gabions according to your dimensions at the best price online. Our aim is to always be one step ahead of our competitors in terms of price, service and other conditions. We do not only provide our high quality gabions to private customers, but also to commercial companies on a large scale. The word Gabione comes from Italian and originally means "big cage". 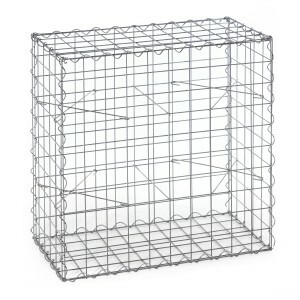 In today's language and in connection with modern garden design, when we speak of a gabion we mean a lattice, wire, stone or rubble basket. The gabion baskets are exposed to a salt spray test lasting at least 3,000 hours and comply with the DIN EN 9227 NSS standard. 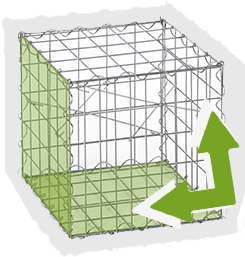 This test shows that our gabion baskets are of the highest quality and guarantee a long service life - at an optimum price/performance ratio. 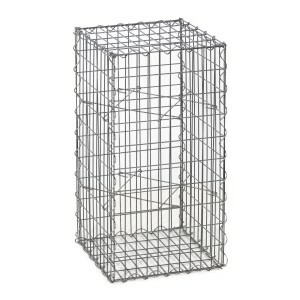 If you buy gabions then only in top quality which withstands the weather. If you value privacy and want to protect your property or your garden against unwanted glances, the best way to do this is with a gabion wall. The effort required to build a gabion wall is very low compared to a classic wall and can easily be done by yourself with a little craftsmanship. The use of gabions is quite inexpensive. Buying gabions in our shop is easy, delivery is fast. Thanks to gabions, a privacy screen can be set up very quickly. A hedge, on the other hand, would take many years and much maintenance to reach the same height. Each gabion can also be embellished with suitable plants, so that green growth on the privacy screen does not have to be dispensed with. These are all reasons why gabions have become an indispensable part of modern garden design and are finding more and more friends among land and garden owners. If you would like to buy gabions and find out how to use them in advance, please visit our guidebook. Here you will find important tips and informations about gabions and stone baskets. We are happy to receive enquiries, drafts and sketches from our customers in order to implement them afterwards. We see every new project as a challenge that we gladly and enthusiastically accept. We make no difference whether it is a small private property, the construction of a motorway embankment or the bordering of vineyards. Before buying our gabions, we provide our customers with detailed and expert advice, recommend suitable components for gabion construction and finally work out an offer where the prices are right. © 2019 HS Gabionenshop - All rights reserved.